Anyone who loves to bake will treasure this present, and you don’t even have to bake to make these gifts! There’s nothing to it: Select attractive glass bottles; buy plump vanilla beans, rum, and vodka; slit the beans and fit them into the bottles; pour the liquor over the top; and seal. Either make the vanilla and store it for months or give it freshly made and let the recipient watch it turn from light amber to a deep, luscious brown. It’s an especially treasured gift because it keeps on giving—just replenish the amount in the bottle by adding vodka to re-cover the beans. Wash the bottles, including the lids, in hot, soapy water and dry thoroughly. Alternatively, run the bottles through the regular cycle of your dishwasher; wash the lids by hand. Using a sharp paring knife, carefully slit the vanilla beans lengthwise to expose the seeds, without cutting the bean in half. Fit 3 vanilla beans into each bottle. Using a narrow-neck funnel, pour 1 teaspoon of rum into each bottle. Add enough vodka to cover the beans completely, leaving 1/2 inch headspace. Wipe the rims, secure the lids, and label. Store the bottles in a cool, dark place, gently shaking the bottles once a week. The vanilla is ready to use 7 months from the date it was made. Tie each bottle with raffia or ribbon and attach a gift card. To turn this into a gift basket, add the recipe that follows for crème brûlée, a half-dozen fresh eggs from the farmers’ market, some organic heavy cream, and, if desired, 6 traditional white porcelain crème brûlée dishes. You could even add a chef’s torch! 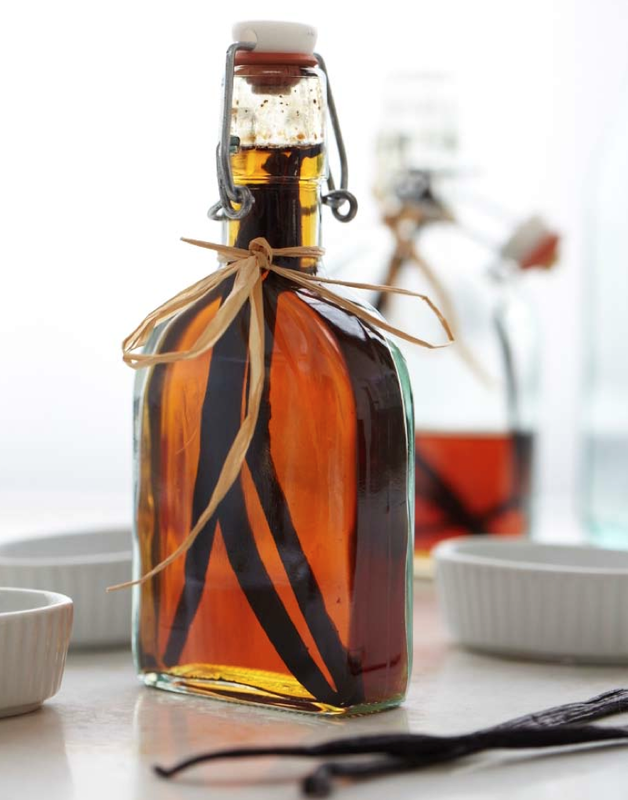 This homemade Seven-Month Vanilla Extract was bottled on [give date] and can be enjoyed for up to 7 years—just replenish the used portion by adding vodka to cover the beans. Preheat the oven to 300°F. Set six (6-ounce) ramekins in a roasting pan. Bring 3 cups heavy cream to a boil. Set aside. Whisk together 6 large egg yolks, 3/4 cup sugar, 2 t. vanilla extract, and 3/4 t. salt. Slowly add the cream and whisk until smooth. Strain the mixture into a 4-cup glass measuring cup or bowl. Fill the ramekins. Place in the oven, and pour hot water into the roasting pan to come halfway up the sides. Bake until the centers are set, 30 to 35 minutes. Lift from the water and cool on a wire rack. Cover and refrigerate. Sprinkle 1 T. of sugar evenly over each custard. Broil until the sugar bubbles and turns caramel color. Serve immediately. Serves 6.